Apart of the insightful and challenging and mind- renewing teachings of Jesus the Christ, these two roads provide for me a striking image and reality. Primarily, there are two roads to travel, two ways to go, two directions to consider, two choices for us to make. This is not complicated; it’s not multiple choice or true or false. It is yes or no, destruction or life. It is our decision to make. Are we headed in the direction that leads to destruction? Or, are we walking in the direction that leads to life? Secondly, there is a way that leads to destruction. Can you imagine the road sign? Destruction, next exit. Destruction, two miles. There is a way to get there, a path that will lead us to destruction. And there is a way to get there because persons want to go. There is interest in the place called destruction and so a road has been constructed. Though the road is wide and easy, it leads to destruction. There is plenty of room on this road; it can accomodate many travelers. Though it is accessible, this road leads to ruin. A familiar route, there are persons who can give you directions to it as it is well- traveled. You can’t miss it; just follow the crowd. Finally, there is another road that leads to life. In the Greek, it is the word zoe and means real life, genuine life and devotion to God. Life is not genuine or real if it is not devoted to God. 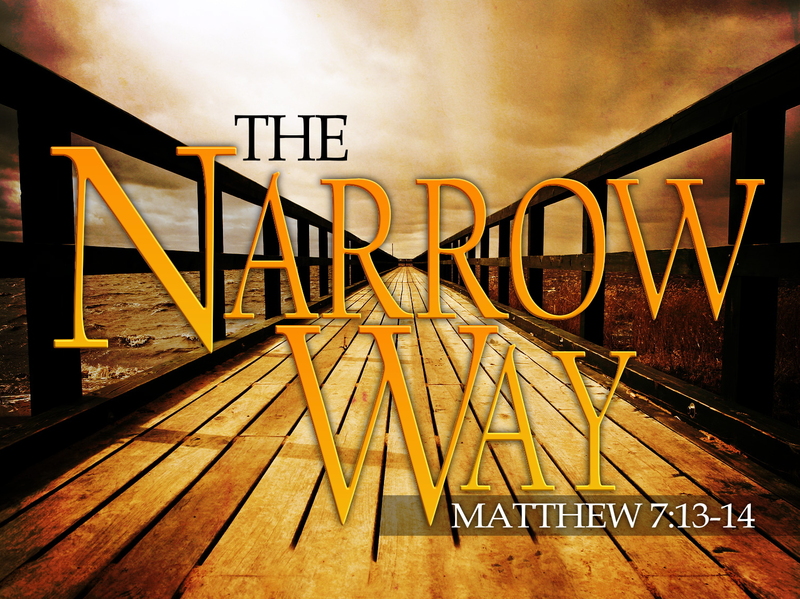 It is narrow because we don’t want to devote ourselves to God. We don’t want to go to God– at least not when things are going well. No, we go to God when we are sick or broke or afraid or sad. We don’t go to God out of devotion. We go to God when we feel like we have no other choice. We go to God because we have to because we don’t like God’s way. It’s narrow and hard and you have to look for it. There aren’t any road signs and it can be lonesome as there aren’t many travelers on this road. I am unsure of how many search for it but few find it. Unlike the road that leads to destruction that you can take; this road must be found. It’s not on any map. You have to search for it. You have to seek it as it is not a popular attraction or a vacation destination. Christ’s truth is applicable to that of race as a racialized identity can be likened to that of the broad way. It’s easy and accessible and everyone is accepting it. The same can be said of the belief in racism, that is that persons of this culture or that are innately and naturally inferior or superior. It’s easy to believe and doesn’t require much work on our part. We can just go along with the crowd, walk in the same direction, in the same way that persons have for hundreds of years now. Or, we can choose the narrow way that is the race-less life. It is hard to travel this road as American society was set up to maintain the social, economic and political hierarchy embedded in racial classification and its systems of oppression and privilege. There is not much room for persons who do not follow the road that leads to a belief in race and the practice of prejudice and stereotyping. It is not an option that is given, a way that is pointed out. There are no signs for it. No, it is a road not taken but found. Oh, Lord help me to find this road and with it, more of You. A race- less life is a Christ- filled life. Amen.